Ahh... root veggies. My Mom's garden provides almost more of these goodies than we can eat, but I'm not one to pass up free food, so my vegetable bin is stuffed. Consequently, I'm always on the lookout for different ways to use parsnips, turnips, beets, onions and/or carrots in recipes that my kids will like. No easy feat, but sometimes I hit on something that works. This combination, oddly enough, has turned out to be a favorite. I say "oddly enough" because I am not a mustard fan and rarely use it in recipes. Apparently my kids like it though. Who knew. **Even though I'm not a mustard fan it is a good flavor contrast here, to the sweet maple syrup and veggies. AND if you really don't like mustard, just leave it out, it's really good without too. 5 cups coarsely chopped or sliced veggies of your choice; turnips, parsnips, rutabaga, carrot, potato, yams, beets and/or golden beets. Preheat oven to 425 degrees. Toss veggies and onions with the olive oil, salt and pepper on a baking pan. Roast in oven for 20 minutes, then remove and re-toss on baking sheet. Cook 15 minutes more. Toss again. Cook another 15 min. Combine maple syrup, Dijon mustard and garlic powder in a small bowl. Drizzle the maple mixture over potatoes and veggies and mix to coat well. Cook again until veggies (beets and potatoes will take the longest) are soft and glaze starts to caramelize and brown a bit. Yum, I love roasted root veggies, they are just perfect, aren't they? Thanks for this idea. yum maple, mustard and veggies! That looks divine. I may have to try this in the crock. I looooove roasted veggies, but with mustard and maple... Now that's knock my socks off yummy! 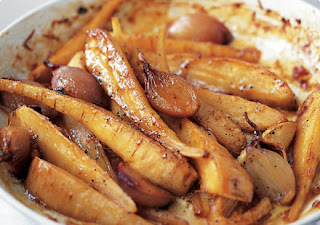 ohhhh, I've had maple-glazed rosted root veggies and the family was speechless, - now added mustard? The hubster will want to marry me again!!! oh. man. that looks/sounds awesome. Ooh, this looks like an excellent flavor combination! Yum!